Wang, H., Wu, T., Wang, X., Cheng, X., Chen, N., and Li, D. (2019). "Effect of ethylenediamine treatment on cellulose nanofibers and the formation of high-strength hydrogels," BioRes. 14(1), 1141-1156. The effect of ethylenediamine (EDA) treatment on cellulose nanofibers (CNFs) remains unclear. To study the effect of EDA treatment on the gelation of the fibrillated CNFs, hydrogels that received 1, 2, and 3 EDA-treatment/washing cycles were prepared and analyzed. Different concentrations of the EDA treatment were also used to prepare hydrogels. Both X-ray diffraction and Fourier transform infrared studies showed that cellulose I/II hybrid hydrogels were fabricated from CNFs via 2 or 3 cycles of 99 wt% EDA treatment and then were washed with water. Field emission scanning electron microscopy observations indicated that the obtained CNF-based hydrogels presented some aggregations via the coalescence of adjacent individual CNFs. Moreover, the hydrogel film with a cellulose I/II crystal structure showed a higher tensile strength of 2.4 MPa and a fracture strain of 23.5%. This was because it had an entangled continuous nanonetwork structure formed after repeated EDA treatment. The authors hope that this work can further stimulate interest in the development of CNF-based hydrogels with multiple structures, properties, and functions for a variety of applications. Cellulose, a linear polymer formed by the linkage of D-glucose with 1,4-β-glycosidic bonds, is the most abundant natural polymer on Earth (Moon et al. 2011; Abe and Yano 2012). Based on different packings of cellulose chains, four different polymorphs of crystalline cellulose (I, II, III, and IV) have been identified, and they are of different unit cell dimensions and chain polarities (Ciolacu et al. 2011; Qinglin et al. 2018). Cellulose I is the crystalline cellulose that is naturally produced by a variety of organisms (trees, plants, tunicates, algae, and bacteria), and it is sometimes referred to as ‘natural’ cellulose. Cellulose I is thermodynamically metastable and can be converted to either cellulose II or III (O’Sullivan 1997; Moon et al. 2011). Cellulose II can be derived from cellulose I either by chemical regeneration or mercerization (O’Sullivan 1997; Habibi et al. 2010). Unlike ‘parallel’ cellulose I, the chains of cellulose II are crystallized in an ‘antiparallel’ fashion. Cellulose III can be obtained by treating cellulose I or cellulose II with liquid ammonia or various amines (Lokhande et al. 1977; Wada et al. 2001). Ethylenediamine (EDA) has been found to change the cellulose I lattice structure to cellulose II or III in previous studies (Lokhande and Thakare 1990; Wada et al. 2008). Lokhande et al. (1976) reported the partial conversion of cellulose I to cellulose II when cotton fibers were swollen and decrystallized by treatment with a 75 wt% aqueous EDA solution, followed by the removal of the reagent via washing with water. Conversion of cellulose I to cellulose III was also reported by Lokhande et al. (1977) when water was replaced with methanol during the washing of the EDA-cellulose complex. Hydrogels are composed of a hydrophilic 3D polymeric network formed by physical, covalent, or ionic crosslinking, and they show great promise for applications in pollutant adsorbents (Udoetok et al. 2016), tissue engineering (Choi et al. 2018; Fan et al. 2018), biomedical engineering (Brown and Anseth 2017), energy storage (Wu et al. 2013; Nyström et al. 2015), and more. As hydrogels improve through better design, they have drawn considerable interest in recent years. There are two major types of hydrogels, synthetic and natural, depending on their origin (Chen et al. 2015). Among all natural polymers, cellulose is an ideal candidate for preparing hydrogels due to its biocompatibility, biodegradability, low toxicity, and natural abundance (Way et al. 2012; Jingquan et al. 2017). Cellulose organizes in a rather complex fashion in which an extended inter- and intramolecular network of hydrogen bonds has been identified as the basis of cohesion between cellulose molecules to form a supramolecular structure (Lu et al. 2018). Compared with natural cellulose, cellulose nanofibers (CNFs) have many extraordinary advantages, such as low density, high tensile strength, biodegradability, and environmental benefits (Zhao et al. 2015; Oksman et al. 2016). Thus, they have exhibited great reinforcing potential in composite materials (Saba et al. 2017) and hydrogels (Abe and Yano 2012; Xu et al. 2016; Fan et al. 2018). Cellulose exists in the form of crystalline nanofibers in nature. The elastic modulus of the crystalline regions of cellulose I and II have been reported to be 138 GPa and 88 GPa, respectively (Nishino et al. 1995). 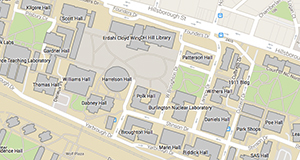 Furthermore, CNFs, having a high aspect ratio, can easily form entangled networks. Therefore, the fabrication of hydrogels from CNFs can lead to a series of novel bulk materials by combining the remarkable performance of CNFs with the unique structure and property of hydrogels (Fan et al. 2018). Recently, several hydrogels were developed through solution/solvent exchange methods. For example, to fabricate robust CNF-based hydrogels, a benign solution/solvent exchange treatment was developed by adding different water miscible solutions/solvents to a CNF aqueous suspension. In this case, the CNFs self-aggregated and formed self-standing gels during the solution/solvent exchange treatment (Fan et al. 2018). An aqueous suspension of tunicate CNF was solvent-exchanged with a water miscible solvent (e.g., acetone) to generate a self-standing gel, and this gel was further developed as a self-assembled nanofiber template for the processing of polymer nanocomposites (Capadona et al. 2007). Hydrogels have also been prepared from CNF aqueous suspensions via alkaline treatment (Abe and Yano 2012). For most natural polymer-based hydrogels, their limited strength and toughness, i.e., poor mechanical strength, has been a major stumbling block for their application (Lu et al. 2018). Generally, the common methods for improving hydrogels’ mechanical performance include the addition of chemicals, such as crosslinking agents and application of chemical modification, etc., which are relatively high cost and difficult (Zhao et al. 2014). The construction of natural polymer-based hydrogels with high mechanical properties is essential to their promising applications in biomedical materials, biosensors, tissue engineering, etc. (Lu et al. 2018). In previous studies, the preparation of cellulose-based hydrogels almost always has involved the synthesis of water-soluble cellulose derivatives or the use of specific solvents such as LiCl/dimethylacetamide, N-methylmorpholine-N-oxide, ionic liquids, and alkali/urea aqueous systems (Abe and Yano 2012). Unlike the above traditional methods, the present article describes the preparation of CNF-based hydrogel without dissolving cellulose in specific solvents and consisting of three dimensional networks capable of having different crystal forms in response to the increasing concentration and numbers of EDA treatment. Studies on how EDA treatment affects the structure and property of CNF have not been reported yet. The gelation of CNF in EDA solutions also has not been elucidated. The CNF aqueous suspensions (with 1 wt% nanofiber) lose their fluidity and exhibit a high viscosity due to their high surface area and entanglement. Based on this unique nature of a CNF suspension, the authors have described an easy preparation of hydrogels from CNF in this article. The CNF-based hydrogel films were prepared with different numbers and different concentrations of EDA treatment. The crystal structure, morphology, and tensile property of the obtained hydrogel films were analyzed. The raw material for the cellulose nanofiber was ground wood powder from Pinus sylvestris var. mongolica Litv. that was obtained from Heilongjiang, Northeast China. Ethylenediamine (EDA; ≥ 99 wt%) was obtained from Shanghai Chemical Reagent Co., Ltd., Shanghai, China. Ground wood powder passed through a 60-mesh sieve and was purified by a chemical treatment. The subsequent procedure followed the method described in previous studies (Abe et al. 2007). In brief, lignin was removed using an acidified sodium chlorite solution. Then, hemicelluloses were removed using an alkaline treatment with potassium hydroxide. After each chemical treatment, the sample was filtered and rinsed with distilled water until a neutral pH was reached. The α-cellulose content of the purified sample was approximately 84.5% when determined by extraction with 17.5 wt% sodium hydroxide solution. Lastly, an aqueous suspension with 1 wt% undried purified sample was passed once through a grinder (MKCA6-3; Masuko Sangyo Co., Saitama, Japan) at 1,500 rpm to obtain the CNF. The grinding treatment was performed with a clearance gauge of –2.5 from the zero position (corresponding to a 0.25 mm shift). The preparation process of hydrogels was as follows. The CNF suspensions were diluted to 0.2 wt% in distilled water and then slowly vacuum filtered into wet CNF sheets with a glass filter, using a filter paper (pore size: 0.2 μm). The wet CNF sheets were obtained at a fiber content of approximately 8.7 wt% and were then immersed in EDA at 35 °C for 3 h. The reduction in EDA concentration caused by immersing the wet sheets in this solution was less than 2 wt%. Afterwards, the sheets were thoroughly washed and soaked in distilled water to remove the reagent. The above EDA-treatment/washing cycle was repeated if needed. The effect of the EDA concentration on the formation of hydrogels was also studied. The dimensional changes with EDA treatment were determined by the diameter of the obtained hydrogels. The nanofiber content of the hydrogels was calculated by measuring the weights of the hydrogels and the oven dried hydrogel. X-ray diffraction measurements were conducted with a Rigaku X-ray diffractometer (Smartlab; Rigaku Corp., Tokyo, Japan) with CuKα radiation (40 kV and 40 mA) over a range of 5° to 40°, at a scan speed of 5°/min. The samples for X-ray diffraction were prepared by freeze drying and then pressed into sheets. 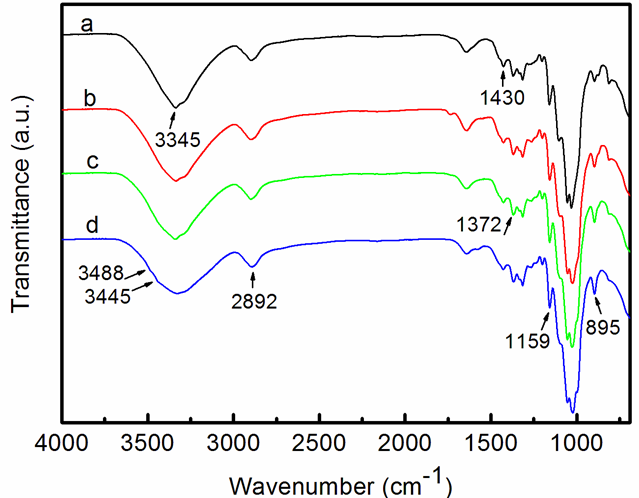 The FTIR spectra of the samples were recorded on a Fourier transform infrared instrument (Nicolet IS10; Thermo Fisher Scientific, Waltham, USA) under attenuated total reflectance (ATR) mode. All of the samples were tested through an accumulation of 64 scans, with a resolution of 2 cm-1, at 500 cm-1 to 4000 cm-1. A field emission scanning electron microscope (JSM-6700F; JEOL Ltd., Tokyo, Japan) was used to study morphological features of the CNF and hydrogels. Samples were solvent-exchanged and then freeze dried to prevent structural collapse during dehydration. The tensile properties of the 30-mm-long and 6-mm-wide specimens were measured using a universal material testing machine (Shenzhen SANS Tensile Machine Co., Ltd., Shenzhen, China) at a crosshead speed of 10 mm/min with a gauge length of 20 mm. The average values of the tensile strength, Young’s modulus, and fracture strain were calculated from at least five specimens. The obtained CNFs were approximately 15 to 30 nm in width and had a high aspect ratio; thus, they could easily form entangled networks. A 1 wt% CNF suspension with high viscosity was prepared in a screw bottle (Fig. 1a), and then 99 wt% EDA was carefully poured into the bottle. Subsequently, the CNF suspensions floated on top of the solution after 48 h (Fig. 1b), and a semitransparent gel that looked similar to jelly was obtained (Fig. 1c). 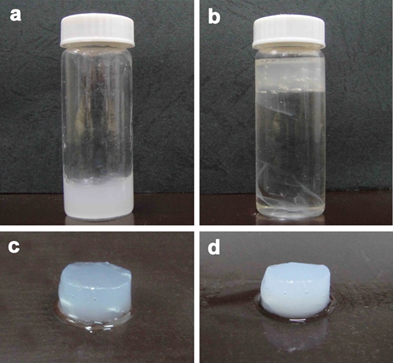 After the suspension was washed with plenty of distilled water, it became milky white and turned into a solid gel with a nanofiber content of 2.2 wt% (Fig. 1d). According to the above result, EDA treatment could facilitate the formation of a CNF-based hydrogel. In this paper, CNF-based hydrogel films were fabricated, and then the crystal structure, morphology, and tensile property of the obtained hydrogel films were analyzed. The hydrogel film was fabricated utilizing the remarkable performance of CNFs. The general process to fabricate hydrogel film is schematically illustrated in Fig. 2, which shows the appearance of a stable hydrogel film prepared by treatment with EDA and washing with water. The EDA-treatment/washing cycles were repeated if needed, and the hydrogel films of the first, second, and third cycles were prepared and analyzed. The effect of the EDA concentration on the formation of hydrogel films was also studied. The wet CNF sheets were soaked in 50 wt%, 75 wt%, and 99 wt% EDA, respectively, at 35 °C for 3 h; then the sheets were thoroughly washed with distilled water. The above 50 wt%, 75 wt%, and 99 wt% EDA-treatment/washing cycles were repeated 3 times to obtain the hydrogel films. In the present study, EDA treatments with different numbers (1, 2, and 3) and different concentrations (50 wt%, 75 wt%, and 99 wt%) were used for preparing CNF-based hydrogel films. As shown in Fig. 3a, the diameter shrinkage of the resultant hydrogel film increased as the number of EDA-treatment/washing cycles increased, and the nanofiber content thereby also increased. For the sample after 1, 2, and 3 cycles of 99 wt% EDA-treatment/washing, the diameter shrinkage ratios were approximately 6.8%, 12.2%, and 15.2%, respectively, compared with the original CNF wet sheet. In Fig. 3b, the diameter shrinkage and nanofiber content of the hydrogel film increased with increasing EDA concentration. For the sample after 1 cycle of 99 wt% EDA-treatment /washing, and the sample after 3 cycles of 50 wt% EDA-treatment/washing, only slight shrinkage was observed. In contrast, the hydrogel films obtained after 3 cycles of EDA-treatment/washing showed the highest shrinkage ratio (15.2%) and nanofiber content (15.5%). The change in shrinkage and fiber content of hydrogel films played a critical role in the morphology, structure, and mechanical properties of the resulting hydrogel films. Previously, the effects of EDA treatment on the crystal structure changes of fibrillated CNF were unclear. According to the above experiment, CNF gelation occurred when the EDA was added. The effect of EDA treatment on the changes in crystal structure of the CNF-based hydrogels was analyzed by using XRD. First, the effect of EDA treatment time on the crystal structure changes of the CNF-based hydrogels was studied. Fig. 4a shows the XRD patterns of the hydrogels after 1 cycle of 99 wt% EDA treatment (for 3 h, 6 h, and 24 h) and then water-washing. The native original CNF obtained from the purified cellulose after one grinding treatment was used as a control group, which presented a typical signature of cellulose I structure, with peaks positioned at 2θ = 16.01°, and 22.25° (French 2013). 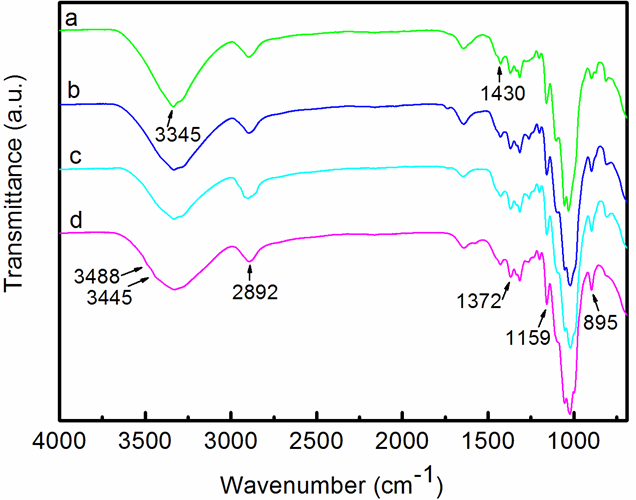 In contrast, the hydrogel after 1 cycle of EDA-treatment/washing (3 h) generally showed XRD patterns characteristic of cellulose I structure, although a very small peak at a 2θ angle of approximately 12.25° and 20.2° (referring to cellulose II) was observed. With the extension of EDA treatment time (6 h or 24 h), the XRD patterns did not change noticeably. Second, the effect of the number of cycles on the crystal structure changes of the CNF-based hydrogels was studied. The 99 wt% EDA-treatment/washing cycles were repeated, and the samples of the first, second, and third cycles were analyzed for changes in the crystal structure by XRD. Figure 4b shows that with the increase of EDA-treatment/washing repetitions, the diffraction peaks formed at 2θ = 12.25°, 20.2°, and 21.8°, referral to the cellulose II structure became increasingly obvious, while the diffraction peaks of the cellulose I structure gradually decreased. Thus, repetition of the EDA-treatment/washing cycles was found to further increase the cellulose II fraction, successively reducing the amount of cellulose I at the same time. The hydrogels after 2 or 3 cycles of EDA-treatment/washing represented a mixture of polymorphs of cellulose I and II. 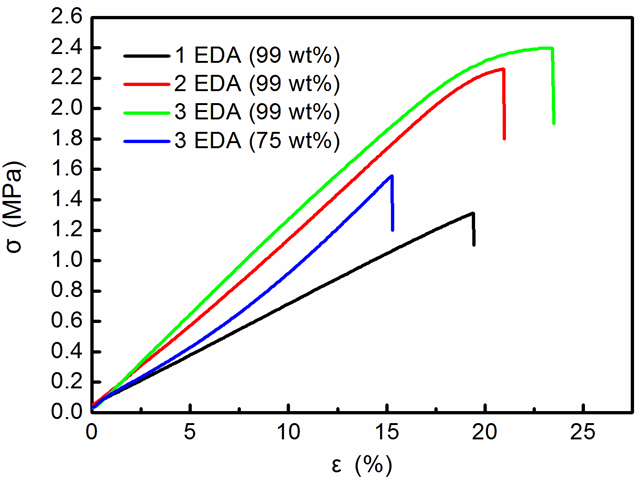 Lastly, to find the effect of EDA concentration on the crystal structure changes of the CNF-based hydrogels, 3 cycles of EDA treatment (in 50%, 75%, and 99 wt% EDA solution, respectively) and washing were conducted. Figure 4c reveals that after 3 cycles of 50 wt% and 75 wt% EDA-treatment/washing, the hydrogels still mainly showed a cellulose I structure. After 3 cycles of 99 wt% EDA-treatment/washing, the hydrogel presented a mixture of polymorphs of cellulose I and II. As shown in Fig. 4c, with an increase in EDA concentration, the cellulose II fraction in the hydrogel increased, and the amount of cellulose I was reduced at the same time. As a result, the XRD studies indicated that the hydrogels prepared in 2 or 3 cycles of 99 wt% EDA-treatment/washing showed X-ray patterns characteristic of cellulose-I/II hybrid crystal forms. It was hypothesized that the transformation from cellulose I to II is occurred by the following mechanism. The wet CNF sheets by vacuum filtration were obtained at water content of approximately 91.3 wt% and were then immersed in EDA at 35 °C for 3 h. Cellulose, which is a long linear polymer of D-glucose with three free hydroxyl groups, is insoluble in water. An EDA molecule, while penetrating in the cellulose crystalline region, may form a bridge between the two cellulose chains. Then water molecules break the EDA-cellulose complex during washing by displacing the EDA molecule in the EDA cellulose chain bridge. As a result of bridge formation, this may give very little chance for the anhydroglucose units of the cellulose chains to rotate, and the cellulose I lattice structure was retained, giving no evidence of the formation of cellulose II lattice structure (Lokhande 1976). If, however, the bridge formation does not occur under certain conditions, and EDA acts as a monoamine, the anhydroglucose unit of a cellulose chain has complete freedom of rotation, giving rise to the conversion of cellulose I structure into cellulose II lattice (Lokhande 1976). As a result, partial conversion of cellulose I into cellulose II is observed. It was suggested that the molecular chains of cellulose are rearranged to form tight combination through strong hydrogen bonding interaction under the effect of EDA treatment and water washing; thus, CNF-based hydrogel with high mechanical performance may be constructed. According to the above XRD analyses, the crystal structure of the CNF-based hydrogels changed as a result of EDA treatment. The FTIR spectroscopy analysis was used to verify the crystal structure changes of the samples by different treatments. 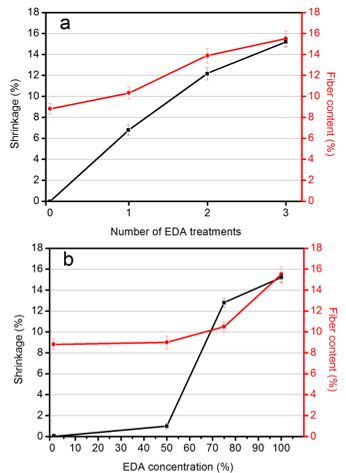 Figure 5 compares the FTIR spectra of the CNF and the CNF-based hydrogel receiving 1, 2, or 3 EDA (99%) treatments. The dominant peaks at 1372 cm-1 and 895 cm-1 appeared in all spectra and signified the –CH and –C1H deformation vibrations of cellulose, respectively. For the CNFs in Fig. 5a, typical cellulose I peaks at 3345 cm-1, which signified the –OH stretching vibration, appeared in the spectrum (Horikawa et al. 2013). In Fig. 5d, small peaks at 3488 cm-1 and 3445 cm-1 emerged (Horikawa et al. 2013), which indicated that the crystal structure of the CNF-based hydrogel was partially converted to cellulose II after 3 cycles of 99% EDA-treatment/washing. In addition, the bands at 2892 cm-1, and the broad band between 3600 cm-1 and 3000 cm-1 were assigned to the C–H stretching in cellulose II and the hydrogen-bonded OH groups, respectively (Široký et al. 2009). In contrast, in Fig. 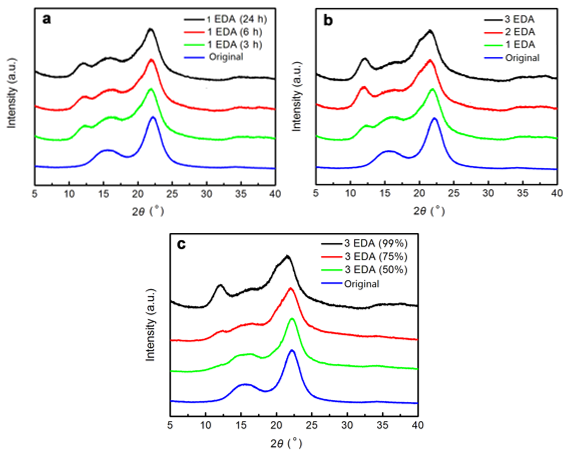 5b, the peaks at 3488 cm-1 and 3445 cm-1 were not obvious, which revealed that the crystal structure of the CNF-based hydrogel that received 1 EDA treatment still mainly showed a cellulose I structure. Figure 6 compares the FTIR spectra of the CNF, and the CNF-based hydrogel that received 3 EDA (50%, 75%, and 99%) treatments. For the hydrogel receiving 50 wt% or 75 wt% EDA treatments, it showed that they still mainly presented a cellulose I structure. The above analyses revealed that the crystal structure of the CNF-based hydrogel was partially converted to cellulose II after 3 EDA (99%) treatments, which indicated the presence of a mixture of cellulose I and II. The X-ray results in Fig. 4 show the presence of hydrogels with different crystal structures. To investigate these morphological features, the FE-SEM observations were conducted on thin hydrogels. The samples were solvent-exchanged and then freeze dried to prevent structure collapse during dehydration. The FE-SEM images (Fig. 7) of the original CNF after a single grinder treatment were used as a control group, which represented a fine network that included continuous nanofibers with a diameter of approximately 15 to 30 nm. The FE-SEM images (Fig. 8) showed the change in the network structures of the CNF-based hydrogel sheet by different cycles of EDA-treatment/washing. In Figs. 8a and 8b, the cellulose I hydrogel, which received 1 cycle of 99 wt% EDA-treatment/washing, showed a similar morphology as the original CNF. The network morphology of the cellulose I/II gel (Figs. 8c through 8d) changed slightly, with some small aggregations appearing. In Figs. 8e and 8f, with an increased number of cycles, more aggregation took place, resulting in an increase in the fiber width. Considering the result of the XRD measurement in Fig. 4b, the structural change of the CNF network in the hydrogel occurred during the repeated EDA-treatment/washing with partial crystal conversion from cellulose I to cellulose II, which was similar to repeated mercerization treatment. With the increasing number of cycles (Figs. 8c through 8f), the CNF-based hydrogels that received 2 or 3 cycles of 99 wt% EDA-treatment/washing presented some aggregation via the coalescence of individual CNFs. 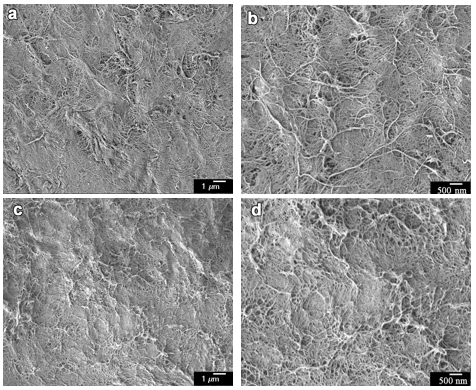 Figure 9 shows the FE-SEM images of the surface network structures of CNF-based hydrogel sheets that received 3 cycles of 50 wt% and 75 wt% aqueous EDA-treatment and then water-washing, respectively. The hydrogel (Figs. 9a and 9b) that received 3 cycles of 50 wt% EDA-treatment/washing showed no obvious morphological structure changes compared to the original CNF. The hydrogel (Figs. 9c and 9d) that received 3 cycles of 75 wt% EDA-treatment/washing showed some aggregations via the coalescence of individual CNFs. To the authors’ knowledge, there are not many reports on hydrogels that combine excellent mechanical performance, biocompatibility, and biodegradability (Partlow et al. 2014). Most of the traditional hydrogels are mechanically weak due to their high water content and relatively fragile polymer networks in the fully swollen state, which limits their applications where high strength is needed (Johnson et al. 2010). In the present study, CNF-based hydrogel film was prepared via EDA treatments, and the tensile performance was examined. Though the untreated wet sheet had an apparent gel-like texture, it was too fragile for the tensile test. However, when the wet sheets were subjected to EDA (75 wt% or 99 wt%) treatment and water-washing, the sheets were formed into stable and tough hydrogel films with thicknesses of approximately 0.3 mm. In contrast, the wet sheet subjected to 50 wt% EDA-treatment/washing did not easily form a stable hydrogel; thus, it was difficult to test for a tensile property. Figure 10 shows the stress-strain curves of hydrogel films after EDA treatments with different numbers and concentrations. Table 1 shows the averages of tensile strength, Young’s modulus, and fracture strain obtained from the initial stress-strain curves. It was found that the tensile properties of the hydrogel films increased with increasing numbers and concentrations of EDA treatment. The cellulose I hydrogel film after 1 cycle of 99 wt% EDA-treatment/washing showed a tensile strength of 1.3 MPa, and a fracture strain of 19.4%. As shown in Fig. 1, shrinkage behavior was observed for all of the hydrogels. Thus, the longitudinal shrinkage of the CNFs probably contributed to the formation of the cellulose I gel, which corresponded to previous studies (Nakano 2010; Abe and Yano 2012). After 3 cycles of 75 wt% EDA-treatment/washing, the hydrogel film presented a tensile strength of 1.5 MPa and a fracture strain of 15.5%. The cellulose I/II hydrogel after 3 cycles of 99 wt% EDA-treatment/washing presented a higher tensile strength (2.4 MPa), Young’s modulus (12.8 MPa), and fracture strain (23.5%). As shown by the XRD patterns (Fig. 4), for cellulose I/II hydrogel, 2 or 3 cycles of EDA (99 wt%) treatments resulted in partial conversion of the cellulose I structure to a cellulose II structure. It was suggested that the stable and tough cellulose I/II gel that was obtained was formed via the entanglement and coalescence of adjacent individual CNFs after repeated EDA-treatment/washing. As a result, the fiber width in the cellulose I/II gel network increased and the tensile properties improved. The effect of EDA treatment on CNFs was studied, and it was reported that EDA treatment and water-washing could change the crystalline structure of native cellulose. The XRD study showed that the cellulose I to cellulose II transformation partially occurred during the gelation process after 2 or 3 cycles of 99 wt% EDA-treatment/washing. The extent of the conversion of cellulose I to cellulose II improved with an increased number of EDA-treatment/washing cycles. Furthermore, 3 cycles of EDA-treatment/washing with different concentrations (50 wt%, 75 wt%, and 99 wt%) were also used to prepare hydrogels. The FE-SEM observations indicated that CNF-based hydrogels that received 2 or 3 cycles presented some aggregations via the coalescence of adjacent individual CNFs. 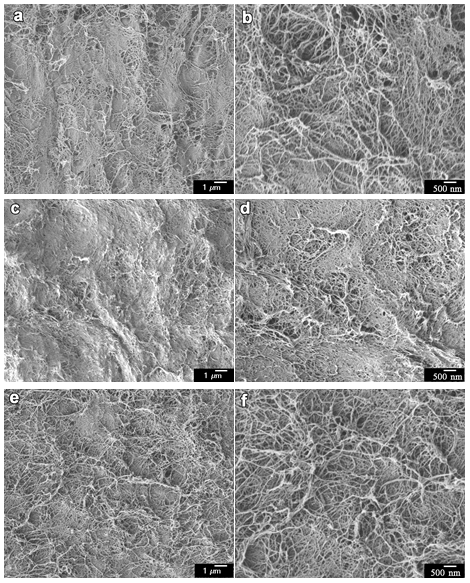 Moreover, the cellulose I/II hydrogel film after 3 cycles of 99 wt% EDA-treatment/washing presented a higher tensile strength (2.4 MPa), Young’s modulus (12.8 MPa), and fracture strain (23.5%). It was inferred that the high tensile properties of the CNF-based hydrogels were attributed to the crystalline structure of the gels. The authors expect that the high mechanical performance combined with desirable biodegradability endow this CNF-based hydrogel with great potential applications as biomedical materials, biosensors, tissue engineering, and energy storage applications. Zhao, Y., Nakajima, T., Yang, J. J., Kurokawa, T., Liu, J., Lu, J., et al. (2014). Article submitted: October 7, 2018; Peer review completed: November 26, 2018; Revised version received: December 3, 2018; Accepted: December 14, 2018; Published: December 19, 2018.